Join the creative trendsetters on the Facebook Page invite or follow First2Forward on Twitter (@first2forward). MC Hyperlink is guaranteed to entertain in a funny mixture of English and Cantonese. And you get to see the hottest links on the current web, ahead of anyone else (apart, from the others who attend of course!). 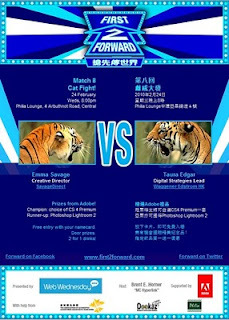 All the links are then shared on the web at www.first2forward.com for you to enjoy at your own leisure, away from all those shy creative types! 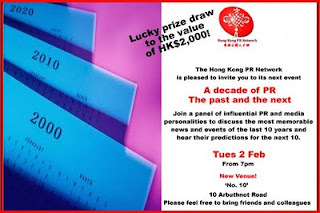 The nice folks at the Hong Kong PR Network have invited me to speak at their monthly gathering tonight to comment on "A Decade of PR: The Past and the Next". After only 5 months working inside the PR industry with Fleishman-Hillard, I'm not sure if I fully qualify for the role but at least my 13 year in digital communications count for something. Over the years, I have dealt with many a PR practitioner, be it in sports marketing or digital marketing, so I have a good understanding from whence they came. Firstly, corporate structure will have changed in order to reflect the (new) way that media is consumed and opinions are formed. This is already happening at big media conglomerates like Disney and Fox, who are breaking down their channel silos. Communications agencies will adapt and move away from job descriptions, like digital agency, media buying house or PR consultancy, and become all round communicators who specialise in a particular industry. There will be a new member of the "C-Suite", known as the "Chief Reputation Officer" (CRO). Not only will this person manage the reputation and public perception of the company and its products but also that of its executives, who will become their own brands (thanks to social media, especially microblogging). Hands-on digital expertise will be at the core of this job. The CRO will have a team of research analysts tracking all channels and providing real-time updates in changes of public (and internal) perceptions. HR will want to know what you say about your company and colleagues, but may not necessarily tell you it's tracking your conversations - call it 24 x 7 "360 assessments"! Public Affairs: governments and individual politicians will become more accountable and more open to direct questions from constituents, but will also get much better at monitoring and directing public opinion. (The tools are already there, but the know how is lacking). Grass roots movements on the Net become the norm. Self-service PR: much like advertising has been commoditized by Google, you will see self-service platforms for buying online influence. Just look at what Nuffnang is doing with bloggers in ASEAN or how you can buy influence in China via the "50 cent gang". Back-2-Boutique: highly fragmented audiences and disperse channels will require consultants to specialise in niche areas, such as healthcare, finance, public affairs. There simply isn't enough time in the day to be an expert at managing communications for multiple clients from different industries. I can't wait to see how the PR professionals refute these theories. The recent earthquake Haiti has struck our hearts and minds. Now it's time to open our wallets! Following in good tradition, we'll be donating 10% of the entrance fees from this month's Web Wednesday social mixer on 3rd February in Hong Kong to Oxfam (樂施會) to support their relief efforts in Haiti. An excerpt of a situation update from the Oxfam website, "Ten tonnes of new stock was flown from the United Kingdom to Santo Domingo in the Dominican Republic on Saturday and has now arrived in Port-au-Prince. Thirty tonnes of stock departed from the UK yesterday and will be followed by a further flight, carrying 50 tonnes of Oxfam aid on Friday. Water trucking has begun in several locations across Port-au-Prince, but operations were briefly halted because of lack of fuel around the capital."